One of the main themes in H.P. Lovecraft’s horrific tales was man’s tenuous grasp on his fragile sanity. It’s pretty safe to say that this theme is carried out splendidly in The Stars Are Right. You will lose sanity points. Resistance is futile. This brain-twisting diversion from Steve Jackson Games is a bit of a conundrum. It’s billed as a card game, but the cards are the simplest component. The real heart of the game lies in the 5×5 grid of tiles adorned with eclipsed moons, stars, meteors and such that constantly shift and switch places during the course of a game. It’s this oft-maddening entropy that lends a nervous edge to every play, and makes this little game stand out. The game goes a little something like this: You start out with the aforementioned 5X5 grid of tiles that represent the night sky. Each tile is double-sided so that they may be flipped during the game to bring up different configurations. 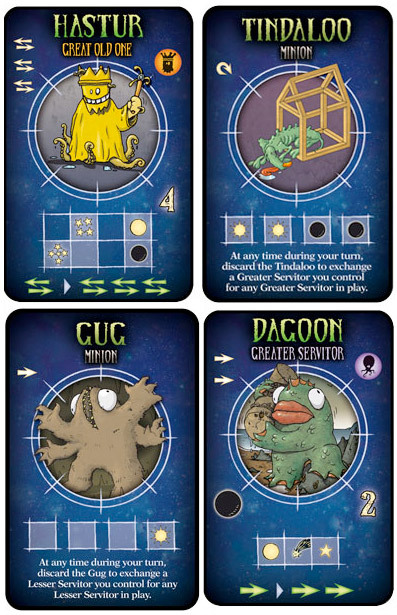 You hold in your hand five cards with various creatures from Lovecraft’s Cthulhu Mythos, ranging from the lowly Gugs and Deep Ones to the Great Old Ones of Hastur and Cthulhu. Each round you can discard a card in your hand to invoke that creature’s power. This power is represented by a symbol(s) in the upper left of the card and allows you to rearrange tiles in the night sky. You may be able to push a row or column of tiles one space, flip any tile to its reverse side or swap the places of two adjacent tiles. 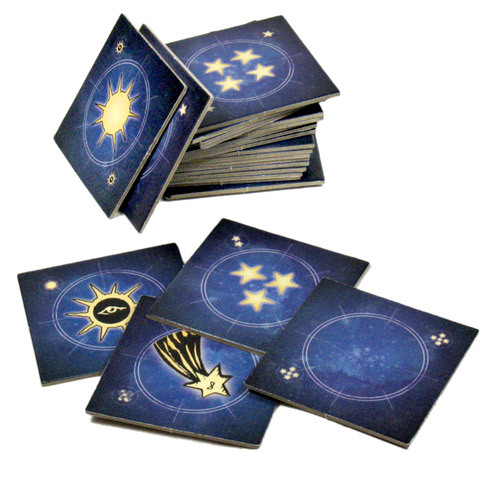 This is the core of the game – by rearranging the night sky, you can align the symbols and when the “stars are right” (matching the symbols in the grid on the creature card) summon a creature from your hand, placing it in front of you. 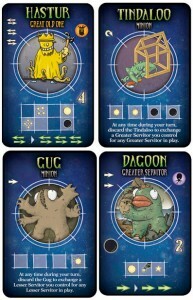 The creature nets you victory points – and 10 points wins the game! A creature can augment a power during invocation. This is represented by the symbols at the bottom of the card. Dagoon, for instance, can turn a “push” into two “pushes.” This simply means that if you invoke a creature and use a “push” power, when Dagoon is in play on your side, you can use this power two times. By summoning bigger and better creatures, you gain more abilities to augment invocation powers, and therefore can create powerful combos from simple actions that can completely rearrange the night sky in one turn. This will not only help you to summon more creatures, but it is sure to drive your opponent insane as you destroy three or four turns of carefully planned actions. A lesser creature can help to summon a greater one. On the left side of each Lesser and Greater Servitor card there is a symbol that corresponds to one of the tiles in the night sky (their Bonus Star), as well as the symbols that are needed summon a Great Old One. When trying to summon a Great Old One, these symbols on the Servitor cards can be substituted for those needed in the summoning, making it much easier to bring out the big guys. At the end of your turn you refresh your hand to five cards (six if you have a Ghast in play). And that’s pretty much it. It seems simple, and it is, once you get the mechanics down. But what seems simple on the surface can often derange you with details. As I’ve said, the night sky is constantly shifting and changing each turn. The trick is to devise a long-term plan, bringing out Servitors that serve the same Great Old One so you can use their Bonus Stars later in the game, and yet remain flexible for the ever-changing tiles. Beginning players can quickly find themselves backed into a corner if they get fixated on bringing out a specific card and not evaluating a creature that might be easier to summon from those available in their hands. 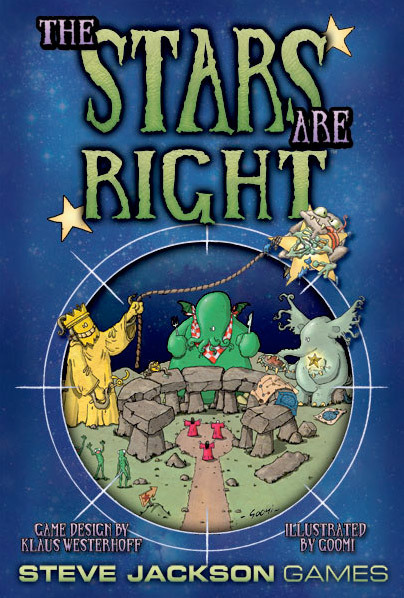 Overall, The Stars Are Right is a great mindbender, and a perfect game to fill the time before or after a much longer, sanity-sapping game such as Arkham Horror. The random placement of tiles at the beginning and the chaotic back and forth of tiles throughout play help make each game different. That said, however, you're left wanting more variety in the cards after a few games. The components are great: The tiles are hefty and will hold up well during all the flipping, pushing and swapping, and the cards are of nice, sturdy quality. The art by Goomi adds a light, whimsical touch to a very dark subject. This game is not for everyone, but for those who enjoy puzzle games, new and interesting game mechanics, or Cthulhu freaks like myself, this game is a blast. Overall score: 15 out of 18 - Summon it, forthwith. Happy gibbering. 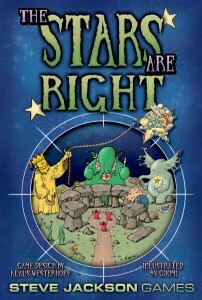 The Stars Are Right is a game for 2 to 4 cultists, published by Steve Jackson Games. It retails for $27.95. I tend to shy away from the “filler” games. I appreciate Fluxx or Zombie Dice as much as the next guy, but I generally prefer to leap from Brass, to Power Grid, to Tigris & Euphrates back to back. However, when I do play filler, I have a good time and like to laugh. Steve Jackson games are good for that. I may have to pick this one up as a good filler when the time requires it (waiting in line, etc. ).